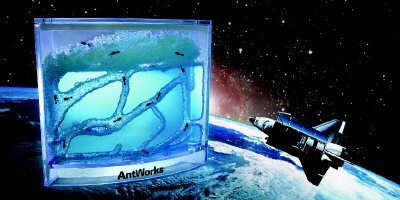 ANTWORKS ® - A space-age habitat for ants! Ants are fascinating creatures. Look at the ground on a fairly nice day, and chances are you’ll see several scurrying around. The ants we interact with in everyday life tend to be scouts or foragers. The colony, with its impressive and complex tunnel system, remains hidden underground. Visible ant habitats, such as the Ant Farm® product (Ant Farm® is a registered trademark of Uncle Milton Industries, Inc.), provide insight into the lives of these amazing insects. Ant Farm habitats enable viewers to peer into the mysterious world of ants and how they tunnel. Usually made of two panes of glass (or clear plastic) and filled with sand, Ant Farm® habitats and their ilk allow a micro colony of ants to be put on display in a home or office. As ants tunnel in the sand, viewers are able to witness a network of tunnels develop before their eyes. Ant habitats using sand may also be created using glass canning jars, and the like. Because you can’t really see through sand, the visible tunnels are pretty much limited to those next to the outside wall. Another important detail about sand and soil based ant habitats – they don’t like to be moved. Shaking, whether from a strong earthquake or human-made, can cause the tunnels to collapse – an Earth-shattering cataclysm, at least from the ants’ perspective. This posed quite a problem for the scientists at NASA, which resulted in an ingenious solution. Gravity is a great indicator of direction. While we may not be certain which way north is without a compass, up and down can always be determined. To what degree, scientists wondered, do ants use gravity in creating their tunnel network? If an ant colony were in a zero-gravity (technically, ‘micro-gravity’), environment, would they know to tunnel down – and how complex would their tunnels be? NASA had been planning experiments around ‘life in space’. The long-term goal, being to discover how certain species react to a micro-gravity environment. Would ants tunnel downward? Would spiders spin webs? These are some of the questions NASA set out to answer. Containers for various forms of life were developed for space flight, however a ‘cosmic colony’ of ants posed a unique puzzle. With a soil/sand-based habitat, NASA and the Space Shuttle crew had two, equally problematic options. If ants were added to the habitat prior to take-off, the tremendous G-forces would collapse any tunnels, killing the ants. Trying to add ants to the habitat in a weightless environment might make for an entertaining ‘bloopers’ video, but would be counter-productive for research. Even if this could be done without the Space Shuttle hosting several rogue floating ants, the tunnels would still collapse from the shaking caused during re-entry. It became clear that NASA needed a habitat ants could live and tunnel in, that could withstand a significant amount of shaking. A special gel material was created which would serve as a tunneling medium for the ants, as well as a nutrient source. AntWorks™ is based on this technology. AntWorks ® - Clearly Innovative! AntWorks ® allows one to study the behavior of ants in a unique, self-contained environment. Its special gel is full of nutrients specially formulated for the needs of the ant. Because the gel is clear, one can see tunnel architecture develop in 3-D – offering a new and unique perspective from that of the traditional, soil-based habitats. AntWorks ®includes a container with a special gel formulation, magnifying glass, 20 page booklet detailing fascinating ant facts, and a special ‘extreme magnification lens’ with which one can even see hairs on the ants! AntWorks ® is amazing, new and Patent Pending.